This cuddly teddy bear pattern is the perfect model for the coordinating teddy bear outfits, listed at right. Do not join rounds. Mark the first stitch of each round (a safety pin makes a good marker). Rnd 1: 8 sc in 2nd ch from hook. Stuff to within about 1″ from top before continuing. Rnd 34: (sc next 2 sc tog) around. Rnd 35: (sc next 2 sc tog) around. End off, leaving an 8″ tail of yarn for sewing. Using a large-eye yarn needle, weave yarn through remaining stitches. Pull tight to close and sew closed. Weave in end. Rnds 1 – 5: Repeat rnds 1 – 5 of body. Rnd 15: (sc in next 4 sc, sc next 2 sc tog) around. Rnds 16, 17: sc in ea sc around. Rnd 18: (sc in next 2 sc, sc next 2 sc tog) around. Stuff to within 1″ of top before continuing. Rnd 19: (sc in next sc, sc next 2 sc tog) around. Rnds 1 – 3: Repeat rnds 1 – 3 of body. Rnd 4: (sc in next 9 sc, hdc in next 3 sc) twice. Rnd 6: Repeat rnd 4, join with slip stitch in 1st sc. With black yarn, using large-eye yarn needle, embroider nose features on center top of muzzle. Embroider mouth shape with straight stitches. Stuff. Using yarn, sew to lower half of head. Rnds 1, 2: Repeat rnds 1 and 2 of body. Rnd 3: Repeat rnd 4 of body. Rnd 4,5: sc in ea sc around. Rnd 6: (sc in next 3 sc, sc next 2 sc tog) around. Rnd 7 – 13: sc in ea sc around. Rnd 14: (sc in next 2 sc, 2 sc in next sc) around. Rnds 15 – 21: sc in ea sc around. At end of rnd 21, join with slip stitch. End off. Stuff. Sew to bottom of body. Rnds 4 – 6: sc in ea sc around. Rnd 8 – 18: sc in ea sc around. End off at end of rnd 18, leaving an 8″ tail of yarn for sewing. Stuff firmly. Sew an arm to each side of body. Row 1: 3 sc in 2nd ch from hook. Turn. Row 2: ch 1, 2 sc across (6 sc). Turn. Row 3: ch 1, (sc in next sc, 2 sc in next sc) across, changing to MC in last sc. (9 sc) Turn. Row 4: With MC, ch 1, (sc in next 2 sc, 2 sc in next sc) across. End off, leaving 8 ” tail for sewing. Row 3: ch 1, (sc in next sc, 2 sc in next sc) across (9 sc). Turn. Row 4: ch 1, (sc in next 2 sc, 2 sc in next sc) across. End off, leaving 8 ” tail for sewing. (Ears are not stuffed.) With MC yarn, using large eye yarn needle, sew inner ear to outer ear around top edge of ears. Making ear into a curved shape as you sew it on, sew ears to top sides of head, leaving about a 1″ space in between the ears. Rnd 1: 7 sc in 2nd ch from hook. Rnd 3: sc in ea sc around. End off. Stuff lightly. Sew to back near bottom of body. (Make 2) ch 2, 5 sc in 2nd ch from hook, sl st in first sc to join. End off. Sew eyes to head just above top edge of muzzle. 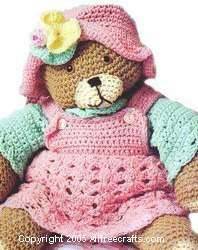 Do you have a pattern for the purple and pink outfit that is shown in the picture of the bear above. I can’t seem to find the pattern for it. The outfit is the same as the one below it just in different colors. 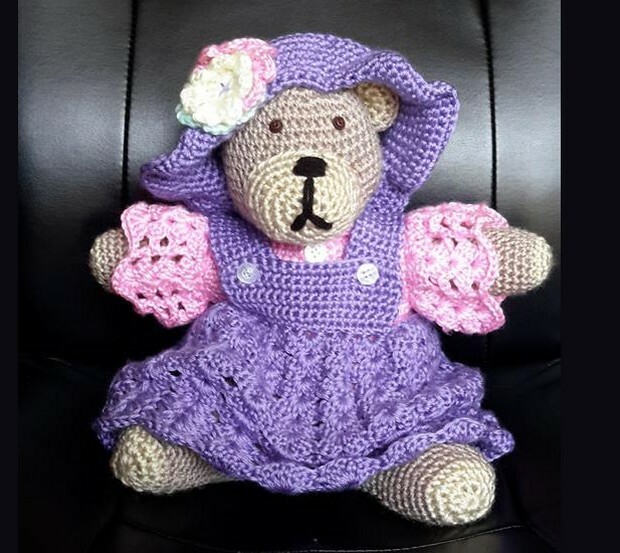 You’ll find the link for the dress just before the beginning of the bear pattern. Some people are finding it works up too big for their bear, in which case you’ll need to use a smaller hook. Loving this pattern…. Making 2 of them for my great neices. Can you tell me how you attached the legs & arms?? Do you attach them like the head? Or do you crochet the ends closed then attach? I have this same question!! Can someone please help? I have made my first ever stuffed animal and although the eyes are a bit crossed and the nose slightly squeezed I love it. But I have now seen this beautiful bear and I am in love. I have four grand daughters all of whom expect nana to have something every time they come I’m going to make 5 one for me! Thank you. I especially like the “one for me” because you deserve it, nana, after crocheting four delightful bears for four lucky granddaughters. Your comment made my day. Love it! Hi, Leonie, Row 3 ends with 24 stitches, and Row 4 has 32. Hope this helps you. Good luck! Can you please tell me how many balls of the MC is required? Your little Stella is so lucky to have a grandma willing to make her a special teddy bear, especially with handspun wool. What an heirloom that will be. I still have my childhood bear (rather scruffy and bald in places) and I love him as much as ever. Do let me know how your teddy turns out. I’m sure it’ll be lovely! Hi, Ria, Thought you might like to see the new photo that I added, of this bear pattern done by Teresa McCullough. I think it’s adorable! I am having a problem with the clothes being too large for the bear. Also, in the pattern for the shirt on row 7, how do you actually sc crochet under the arm since to have sc in the 20 chains of the arms? I just finished the bear. Finished size from top of head to tip of foot is 21 inches. The dress however is much too big. I am going to try making it again with a smaller hook. I wanted to make a big bear while looking I saw this beauty. There are a few ways to change the size of the bear. Use smaller hook for smaller bear, or larger hook for a larger bear. However, I’ve noticed, depending on the pattern, if you are going bigger, you might notice the “holes” are larger and you need to tighten the tension on the yarn to correct. I tend to have a naturally tight tension… and my stuff is never as large as the pattern says. So, with a larger hook, one size, it usually turns out right. But, the tension and the hook size are the only ways i know. There have been several inquiries as to the size of the bear, but no responses. Can someone who has made the bear already please let us know? Love the Teddy Bear. I collect Teddy bears. My ex coworker is having a baby girl in July. I am going to try and make one for her shower. That is so nice of you, Debbie. I’m sure your bear will be beautiful.